My daughter is a born decorator and crafter. She can take anything plain and simple and turn it into something spectacular. She just loves to make things her own by adding a little something unique to it. So when I heard about Pom Pow Wow! I knew it was made just for her. Okay so maybe not just for her, but it was made for girls like her that like to add some style to ordinary, everyday items. It's one of those things that seem so simple, yet are genius. A quick and easy way for girls to craft and create and make things uniquely their own. By using little pom pom flourishes and adhesive dots you can stick them all over things and give them some dimension, color, and uniqueness. And because they are made with little pieces of yarn they are super soft too. Pom Pow Wow! is a lifestyle brand empowering girls to adorn their personal items with pom-pom flourishes. The do-it-yourself crafts kits enable girls to express themselves in a unique, customized fashion. 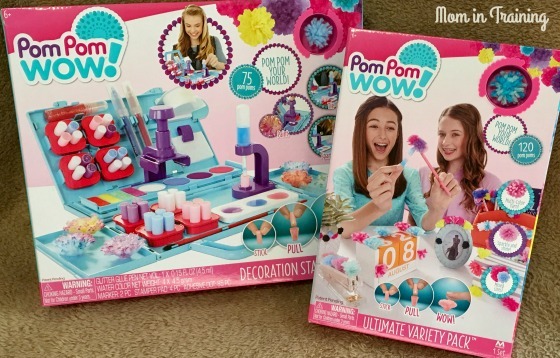 The product line is designed to delight girls through personality and make-it-mine play patterns, as well as a world of colorful design opportunities. With the Ultimate Variety Pack, you can Pom Pom your room, your school supplies, and even your style. The kit features 120 Pom Poms in four different assortments: Solid, Blend, Sparkle, Mini. In addition, the Ultimate Variety Pack includes 135 adhesive dots.